Kymberly loves teaching and learning, and both are so much easier with diagrams! She originally studied programming, but shifted into technical documentation and then teaching languages. She's now happily diagramming and writing to help people learn and make their (work) lives more efficient. Your company's IT architecture is getting more complex, and changing faster than ever. Cloudockit lets you automatically visualize your cloud architectures and export this to draw.io. 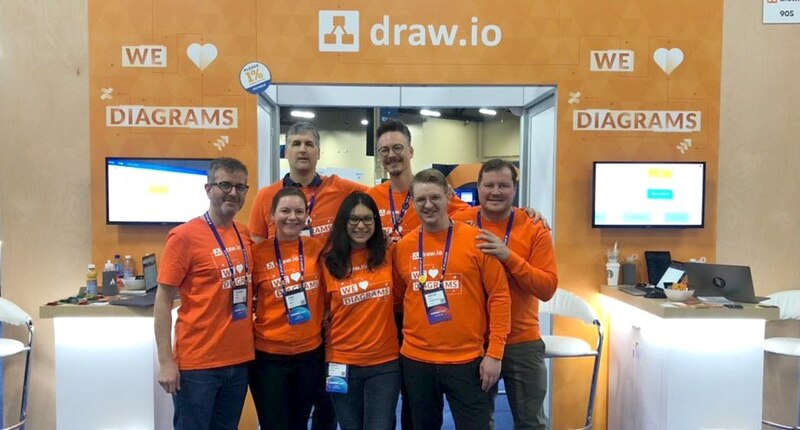 Come and say hello to the draw.io team at booth 905 at Atlassian Summit 2019 in Las Vegas - we have chocolate! We would love to give you a demonstration and explain why keep your diagram data secure and private is important in today's world. Collaboration in Confluence got a massive boost in version 6.0 when Atlassian added support for collaborative editing, and you can now merge simultaneous changes on draw.io diagrams in draw.io for Confluence Server. One of the most heavily used features in Confluence is the ability to comment on content, and now you can comment on draw.io diagrams in Confluence Cloud! You can easily create your own Business Model Canvas in draw.io with your distributed team using our template. A business model canvas visually shows you the different aspects that must be considered when building your business or improving an existing business and lets you focus on how you can best attract customers and partners, build the best product and service and mitigate potential problems. By editing key:value pairs in draw.io (Edit > Edit Style, Cmd or Ctrl+E), you gain complete control over how your shapes and connectors appear in your diagrams. There are hundreds of key:value pairs that can be customized - open these sample diagrams in draw.io to see what is possible. Come to Summit 2019 and our popular app information session! 2018 is nearly at an end – have a lovely holiday season! What do you think about draw.io? We want to make draw.io better for you! Help us focus our development on the features that you use or would like to see - please fill in the feedback form in this post. PlantUML lets you specify your UML diagrams in a text format, which is quite a handy shortcut for programmers. draw.io allows you to insert PlantUML and Graphviz DOT code and automatically adds the diagram image to the drawing area.